Last week, NASA released unique satellite reconnaissance photos of the landing site of the Chinese lunar mission, which made history last month by achieving humanity's first-ever successful soft landing on the far side of the Moon. China's Chang'e-4 spacecraft and its Yutu-2 lunar rover have entered sleep mode to wait out the cold lunar night, during which temperatures can plunge to as low as —190 degrees Celsius, a press release by the China Lunar Exploration Program has confirmed. The mission, which landed on the far side of the Moon on January 3, powered down at 7 PM on Sunday Beijing time in preparation for the lunar sunset 24 hours later. Lunar nights last roughly two Earth weeks, with the Yutu-2 expected to wake up February 28, and the Chang'e-4 following a day later on March 1. 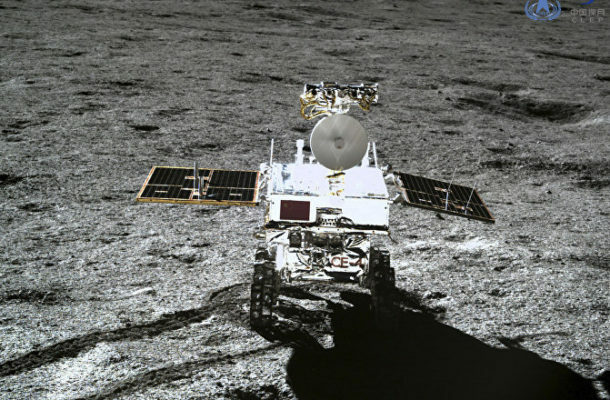 The scheduled power down was the second since January, with Yutu-2 and Chang'e-4 powering up to continue their scientific mission on January 28 and 29, respectively. China's second successful Moon mission includes the study of the lunar environment, cosmic radiation and interactions between solar wind and the Moon's surface. Since waking late last month, Yutu-2 accumulated 120 meters of driving time, sending the information back to scientists on Earth. Chinese space scientists say all systems aboard both devices are operating as normal, and that experiments are continuing as planned. The solar-powered craft made its historic landing in the eastern section of the Von Karman crater, located in the southern hemisphere near the Aitken basin, known as the lunar South Pole, last month. The spacecraft has already performed a number of firsts, including the first biological experiment in human history on the lunar surface by germinating a cotton seed aboard the Chang'e lander. The lander and rover are fitted out with a series of advanced instruments, including a low frequency radio astronomy instruments co-developed by China and the Netherlands, and a Russian-made radioisotope thermoelectric generator which made it possible to measure temperatures during the previous lunar night cycle.